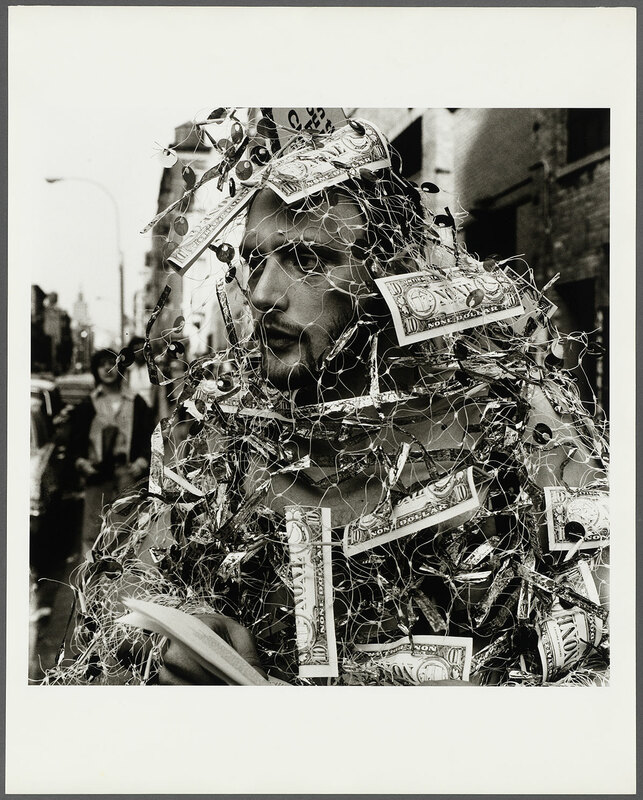 Peter Hujar Archive, LLC., inventory number: EPH1488-1. Verso: stamp, "The Estate of Peter Hujar, Stephen Koch Executor, Printed by the Artist"; stamp, "Copyright 1983, The Estate of Peter Hujar, Not to be Reproduced Without Written Permission from the Estate"; stamp, "From the Estate #"; in pencil, 713-2-7"; signed in pencil, "Stephen Koch"; in pencil, "EPH 1488-1"; in pencil, "HUJ 180"; in pencil, "Stephen Varble, SOHO-1976". Half-length portrait of Stephen Varble, facing three-quarters to the left, covered by a net interwoven with dollars.